Rating: Average 4.19 / 5 out of 95 total votes. 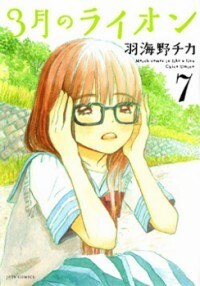 Summary: Kiriyama Rei is a 17 year old professional shogi player and very good at it, but in real life, he has nothing. Quiet and not very social, Rei has no family, no friends, and he doesn't go to school. He is acquainted with a neighboring woman named Akari who is single-handedly raising her two younger sisters, Momo and Hinata. This is a slice-of-life-ish seinen manga, with strong monologues and reflections by Rei.